From Alderaan Princess to Rebel Alliance General – Leia Shines in Gold! In the Star Wars™ universe, there is no shortage of heroes – and Princess Leia Organa is the first one that film audiences saw in 1977. The Rebel Alliance spy sent plans for the Death Star to Tatooine via R2-D2, took shots against invading Storm Troopers and went toe to toe with Darth Vader -- all in the first few minutes alone! From her opening salvo, Carrie Fisher’s portrayal of Leia proved that she would be a force to reckon with for films to come. Through four movies (and more to come), the princess has evolved to become a Rebel Alliance general – worn from the fight, but not losing any bit of her steely resolve and commitment to the Resistance. In the process, she has transcended from a fictional character into a hero for millions. 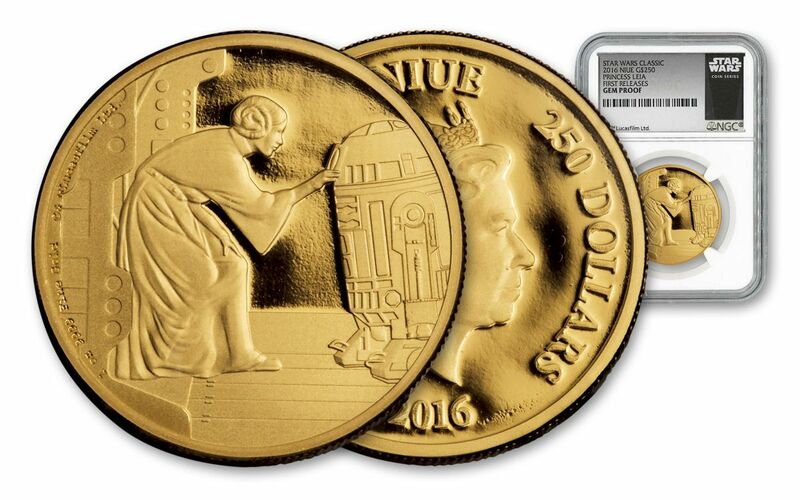 To celebrate this iconic character, Lucasfilm Ltd. and the New Zealand Mint have produced a special Leia commemorative gold coin – the fifth classic character in a series of Star Wars gold coins to be released throughout 2016 and 2017. 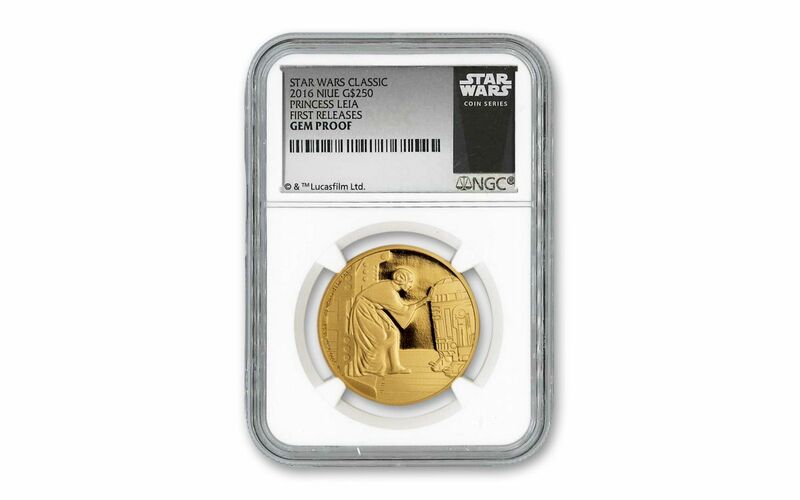 This one ounce Proof coin, struck in 99.99% pure gold, depicts Leia’s first appearance in 1977’s Star Wars Episode IV: A New Hope. Recording her message for Obi-Wan Kenobi’s help on R2-D2, Leia sets the entire legendary series into motion. Engraved in stunning, intricate detail, the scene is made all the more impressive through the use of selected gold planchets and specially manufactured polished dies. 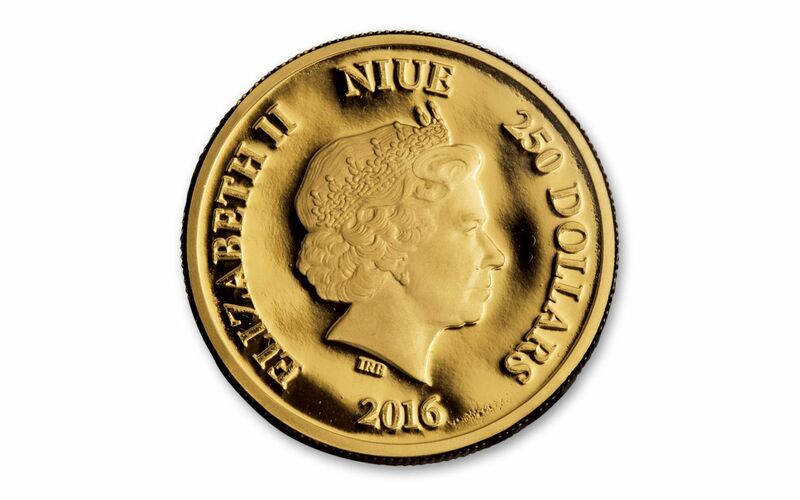 And, since this commemorative Proof is legal-tender for the Pacific Island of Niue, the other side of the coin shows a portrait of Her Majesty Queen Elizabeth II along with the official denomination of $250 Niue. Your Princess Leia Gold Proof also comes with irresistible features that are hard to find anywhere else! Your coin will be graded Proof-70 Ultra Cameo (PF70 UC) by Numismatic Guaranty Corporation (NGC), a distinction that means your perfectly-graded Princess Leia Proof will showcase deeply mirrored fields and frosted details that are above and beyond the quality of other proofs -- all in flawless condition! In addition, your Princess Leia Proof will be certified First Releases (FR) by NGC, meaning that your coin was among the first struck by the mint and was verified within the 30 days of issue. Finally, your proof will be sonically sealed in an acrylic case with a black core insert -- giving you the best in protection while giving you clear sightlines into every beautiful detail -- and presented in a black velvet bag. Plus, you’ll receive all of the New Zealand Mint’s original Star Wars themed packaging for the Proof, accompanied by a numbered certificate of authenticity. 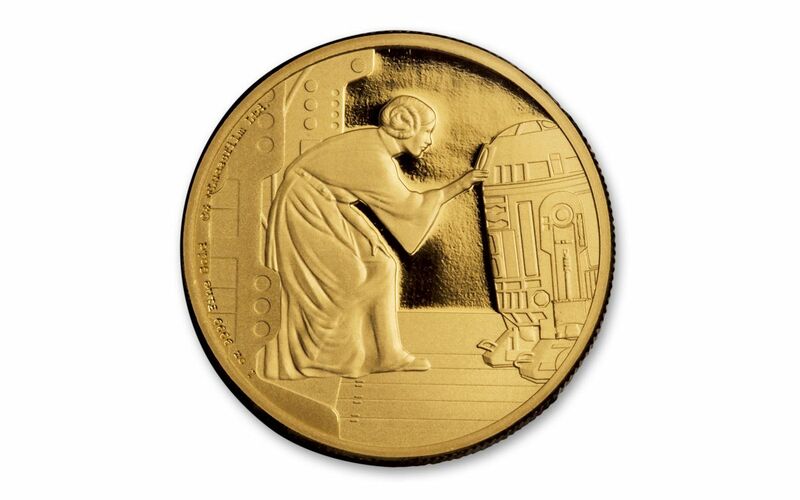 Only 500 coins will be produced for collectors and Star Wars fans worldwide. Don’t miss out on this chance to add this momentous Proof to your collection. Dial it into your cart now!